The paperback version of Where's My Miracle? Nothing can describe the horror of hearing doctors say, "You will never walk or use your hands again." Or -- "You have cancer. I'm afraid it's terminal." Like many people, you look to the Lord and pray for healing. You have friends and the pastor pray for you, but nothing happens. You read Scripture and claim the promises. You even have someone anoint you with oil or go to a healing crusade. But God doesn't give you your miracle. You confess every possible sin and search your heart for any unconfessed sin. Your faith is strong and you tell everyone you will be healed, yet nothing seems to happen. You feel that God is playing a cruel joke or start to blame yourself for a lack of faith. The truth is that God certainly can heal and sometimes does heal people in a miraculous way. But the Bible does not teach that he will always heal those who come to him in faith. What does the Bible REALLY teach about healing? Find joy in knowing God's priorities for your life. Enthusiastically embrace God's will for your life. You can find the joy of serving God despite unanswered prayer in this 14-page minibook. In just 30 minutes or less, you will unlock the door to a new attitude toward life. The topic of unanswered prayer is an issue that author, Joni Eareckson Tada, can speak to personally: A diving accident in 1967, when she was 17, left her a quadriplegic. She has lived 45 years in a wheelchair and she has experienced her share of ups and downs. "But," she says, "oh, the difference the grace of God has made in my life." She has taken her most important insights on turning unanswered prayer into a life of joy (not anxiety) and has encapsulated them into this 14-page minibook. Whether you or a loved one is suffering. This minibook will bring you some help to break free from the strangle hold of fear and worry when God doesn't seem to answer. In this minibook, you will find hope. Joni tells her story of facing the news of being paralyzed the rest of her life. Joni shows you the right way and the wrong way of coming to the Lord for healing. She tells how she dealt with unanswered prayer and passes her tips onto others. You can find freedom from wondering if God is rejecting you. Joni has been there and she shows you the way to peace and joy using biblical principles. Where'S My Miracle? by Tada, Joni Eareckson was published by Rose Publishing in February 2015 and is our 22977th best seller. The ISBN for Where'S My Miracle? is 9781628621570. Reviews of Where'S My Miracle? 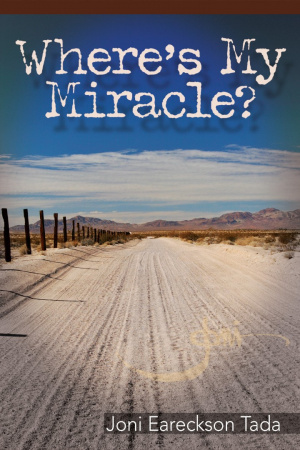 Be the first to review Where'S My Miracle?! Got a question? No problem! Just click here to ask us about Where'S My Miracle?. Details for Where'S My Miracle?